As always for updates, start with my original review first! 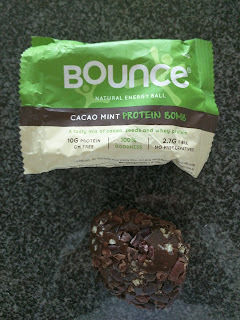 Peanut Cacao Protein Energy Ball. "Not your average protein bar, have a ball instead! If you’re looking for a post workout snack, you’ll go nuts over this one. 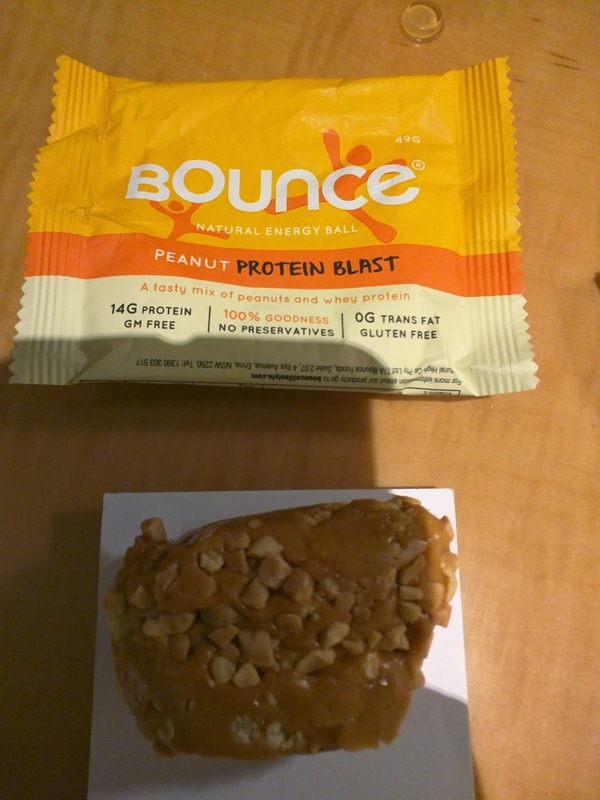 The alpha of the Bounce Ball range, this contender weighs in with a whopping 13g of protein. Peanut butter lovers will enjoy the combination of peanuts and whey protein, and the unsweetened cacao nibs add an extra nutritious twist. 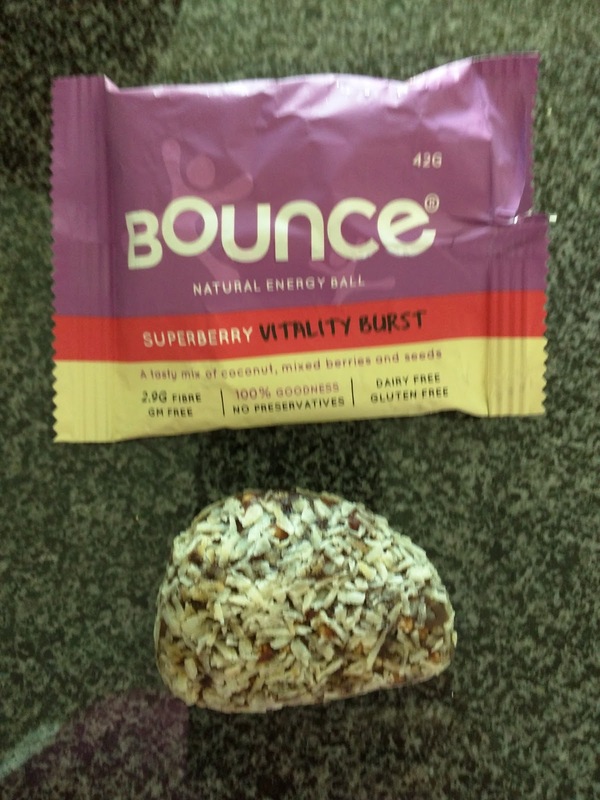 Our protein energy balls are made from 100% natural ingredients that are cold pressed to maintain nutritional integrity. Like all of the flavors in our range, the Peanut Cacao ball is gluten free, GMO-free, and is made with the highest quality whey protein along with peanuts and unsweetened cacao nibs. It's kind of like your favorite energy bar... but in a ball shape, made with real food ingredients you can actually pronounce." 13 grams of protein! In this little tiny ball! This was really nearly tasty. The outside was coated in little bits of peanuts and inside was tons of little tiny nibs for extra crunch. So much crunch! The peanut flavor was there, but not particularly strong. It had a strange sweetness, I guess from brown rice syrup? But, flavors were good, overall. But ... the protein comes from whey protein, a mix of whey protein blend and whey protein crisps, and as always, they make my stomach feel funny, so after a few bites, I had to give this to a friend. Another day, another review of snack food bars that I discovered while visiting our Sydney office, (like Carman's Muesli Rounds that I loved!). These were ... less successful. Bouce makes ... balls. Energy balls. The company was founded by a couple in Australia with health and fitness backgrounds, who wanted to build a snack products that helps people feel good, by highlighting superfoods. They also make protein powders for shakes, but, I only had the balls. 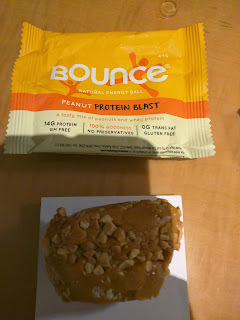 Bounce makes 8 different varieties of these balls, all with kinda funny names: one is a "protein burst", another a "protein bomb", another a "protein punch", yet another is a "protein bliss", etc. Most have protein added via one of my least favorite ingredients, whey protein isolate. They do have interesting flavors, and all have fun coatings like bits of nuts (cashews, almonds, peanuts), coconut, or cocoa nibs. Like many other bars I have tried, they are gluten-free, high in protein, etc. They use natural sweeteners (blue agave, brown rice malt syrup, grape juice, dates) rather than sugar. I tried 5 different flavors. They ranged from truly dreadful (I'm sorry, I can't stand the texture nor flavor of awful whey protein junk) to almost ok (no whey protein, phew). I do appreciate that they take a different spin on traditional energy bars, and really do like some of the outside coatings. But ... whey protein, I just can't take it. "A tasty pocket rocket, bursting with nutrients from the king of nuts. 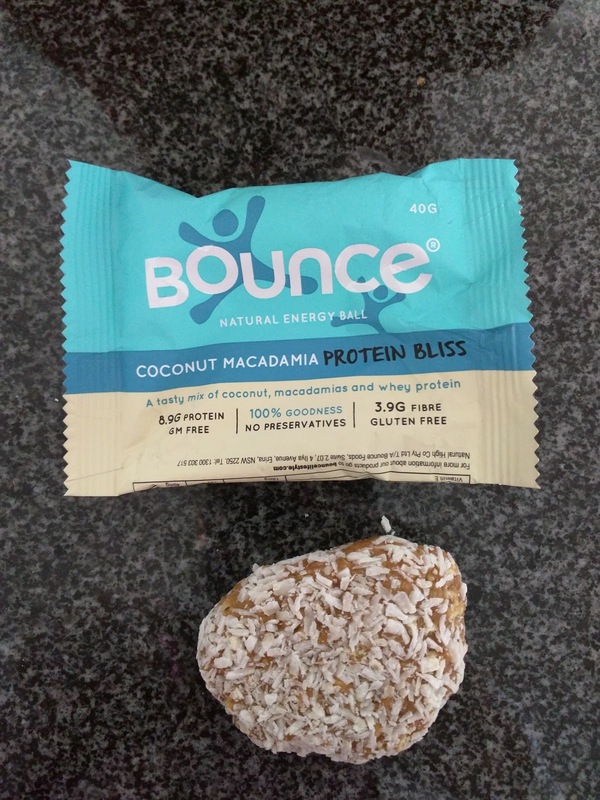 This Ball contains the optimum balance of high quality proteins, complex carbohydrates and heart-healthy mono and unsaturated fats." 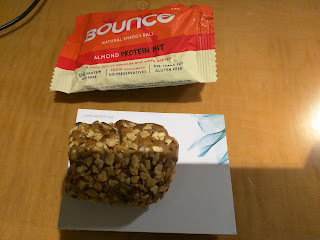 The first Bounce bar I tried was the "Almond Protein Hit". How do you resist a "tasty pocket rocket"? Almonds make up the majority of the ball (29%), with whey protein making up the next largest component (15%). The whey protein shows up in several forms: isolate, hydrolysate, and concentrate. The rest of the ingredient list is a random assortment of stuffs, including brown rice malt syrup and grape juice as sweeteners. I went into it with low hopes since I don't tend to like protein bars, particularly ones with whey protein. I liked the crunchy nuts on the outside, but, I didn't like the flavor of the base. It wasn't necessarily the whey protein I didn't like, rather, it tasted like almond butter, and even though I do like almonds, for some reason, I don't generally like almond butter. So not as awful as I feared, but, not something I wanted another of. "The Golden Nugget - a filling and satisfying powerhouse of protein,packed with peanuts, to help keep you energised and feeling at your best." Next, I moved on to a peanut based one, since I identified the almond as the problem in the first ball I tried. The one is primarily peanuts (34%), plus all the expected whey proteins (22%), and the laundry list of ingredients I also found in the almond bar. This one didn't look very good, the nut coating wasn't as evenly distributed, and the ball itself was kinda mushed. 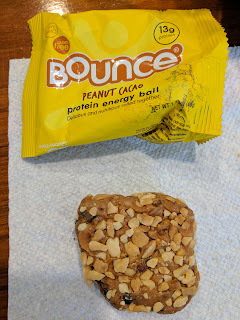 Perhaps it was the higher nut percentage in this ball, or perhaps it was the fact that I've been craving peanut butter lately, but I liked this one far more. The crunch of the bits of peanut on the outside, just like the almonds on the previous ball, were again a nice touch. The ball itself had a decent peanut flavor. It obviously still had whey protein stuff, but, I *almost* liked it. My favorite of the balls, and the only one I'd consider eating again. "An epic new recipe that harnesses the healthy power of cacao nibs, sunflower seeds, quality proteins and rice bran. It’s exploding with delicious, nutritious goodness." After the near success of the Peanut Protein Blast, I decided to keep trying Bounce balls, since they seemed so close to tasty. For my next bar, I selected the one that sounded like dessert: cocoa mint! At first, this looked like a winner. The outside was coated in crunchy cacao nibs. I loved the crunch and the nibs. But the ball itself ... the texture and the flavor were just awful. All I could taste was the whey protein isolate, or maybe the whey protein concentrate, or perhaps the pea protein concentrate. Whatever it was, it was awful. It was also very bitter, likely from the sunflower seeds, which made up 19% of the ball. The flavor was just dreadful, and the aftertaste lingered on and on. No amount of nibs could save this one. Coconut & Macadamia Protein Bliss. "Not only is it packed with macadamias, cashews and coconut, this delicious favourite is also high in protein, fibre and antioxidants. Wow." But still I persevered. Maybe macadamias would be the magic touch? This ball fared about the same as the almond and peanut ones. It was almost good. I liked the crunch from the macadamias inside. I liked the coconut coating. But ... alas, whey protein. Whey protein makes up 18% of this bar, with macadamias only weighing in at 6%. A surprise is that cashews make up 12%. I didn't actually taste the cashews, but I was surprised to see them in the ball. I guess they provide a nutty taste, and are cheaper than macadamias? Not one I'd get again, but not as offensive as some others. "Gluten and dairy free, the Superberry Vitality Burst has been developed to meet the requirements of those with specific dietary needs. Combining cranberries, goji berries, raspberries and coconut, the flavours are a sumptuous mix that tantalise your taste buds." For my final attempt, I decided to try one that wasn't a Protein Blast/Bliss/Bomb/etc, aka, one that didn't have extra protein junk inside. After all, I know I don't like whey protein. I opted for the Superberry Vitality Burst (the other non-protein one is the Spirulina Ginseng Defence Boost). This one had some promise, and indeed did not have the nasty whey protein. But ... what do most health foods bars have that I also hate? Yup, dates. #1 ingredient in this. This ball had a nice texture, and good fruitiness from the dried cranberries, apples, raspberries, and acai juice. I liked the crunch from goji berries, sesame seeds, sunflower seeds, and crispy rice. But ... dominant flavor? Dates. If you like dates, and fruity things, I think this one is likely actually good. Last year, I went to Aqua S for the first time, and learned why Aqua S had so much hype. 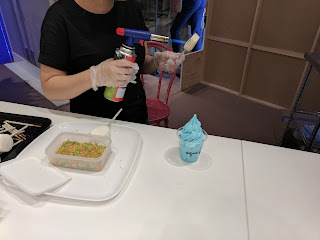 Yes, their brilliant blue soft serve, and ridiculous toppings ARE instagram sensations, but, also, the soft serve ice cream is really, really good. I couldn't wait to return during my visit to Sydney this year. Amazingly, my first weekend in Sydney, I ran into Aqua S, unintentionally, not at their own store. They were at the Gap store, at the Westfield mall, doing a special popup event. They had two soft serve machines set up on the counter. I have no idea if these are the same grade as what they use at the shop, but it was a pretty impressive mobile setup. At the popup, they had only one flavor, the signature sea salt soft serve, and two toppings (colorful popping candy and torched marshmallows, which, they torched to order). The sea salt had a good flavor, slightly salty, sweet. But it wasn't nearly as creamy as I remembered, a bit icy even. I wonder if this was just because of the popup machines? The popping candy was again fun, more fun than sprinkles, and served about the same purpose. The toasted marshmallow I had not had before, even though people Instagram it all the time. It was ... well, a toasted large round marshmallow. It was good, but, I couldn't help but wonder why I was supposed to want it with my ice cream. It was served on a white chocolate cookie stick (Pocky?). Overall, I enjoyed my ice cream, but it wasn't the sort of thing I'd go rushing back for. Matcha Latte (bottom) + Rose (top) ($4) with Popping Candy ($1.50). 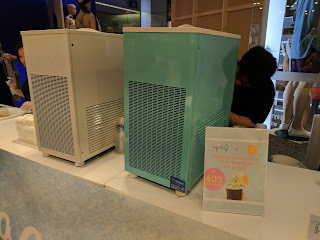 Aqua S rotates their flavors every two weeks now. On this visit, the flavors were matcha latte and rose, in addition to the menu constant sea salt. So options were: matcha latte, rose, or sea salt, all on their own, or matcha + sea salt swirl, rose + sea salt swirl. I was immediately torn by indecision. I knew I liked the rose before when Ojan got it, so that alone, or swirled with sea salt, was certainly a contender. But I love matcha. But I was also worried the matcha would be too strong on its own, and wanted to swirl it with sea salt. So I wasn't actually indecisive. I knew what I wanted: matcha swirl with sea salt on the bottom, rose on top. Which is what I ordered, only to be rejected. "Sorry, only two flavors" she said. I understand the two flavors policy ... in that I couldn't get say, matcha, rose, and sea salt as three separate layers. But the swirl comes out of a single machine, just like a single flavor. I could get matcha without the sea salt on the bottom and rose on top, no problem. How was it actually different to get the swirl than a single flavor? I asked again, saying, "but the swirl is just one lever anyway" or something like that. Still a hard no. I asked if the matcha was very strong, and she said yes. She said it was very bitter and was best swirled with sea salt. But I couldn't get that, and rose. Sigh. She also wouldn't let me sample either flavor. They do not allow any samples. In the end, I opted for the matcha and rose, not swirled since they can't swirl. The rose was lovely. Such a subtle, beautiful flavor. It was a bit intense on its own, and might have been a bit better swirled with sea salt, but it was still fabulous. And, as with my first visit, it was just incredibly creamy and melted perfectly. I loved it. The popping candy was again a fun topping. Like sprinkles, but, actually fun. I really, really enjoyed my ice cream. And then I reached the matcha layer. To say it was bitter is an understatement. It was *crazy* bitter. Now, I love matcha, and this was a great matcha flavor. But ... it was just not at all sweet, and not what I wanted, particularly not after the sweet rose flavor. Really, this needed to be swirled. As I had wanted. I kept trying to like it, but couldn't. I ended up throwing away the bottom of my cone, as I just couldn't bring myself eat it. Just like that matcha, I was bitter. I knew it would be better swirled, and I still really don't understand why it wasn't allowed. Grumble. Policies. But I'll still go back. Aqua S is an ice cream shop in Sydney, named for their signature flavor: Sea Salt, which is ... aqua blue. 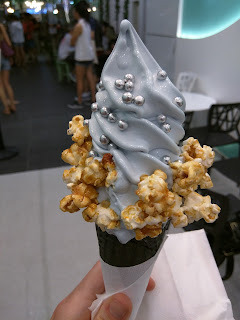 Yes, the sea salt ice cream is blue. This might set the scene a bit for what is to follow. Aqua S opened during my last visit to Sydney, and was a serious rage at the time. Lines out the door and down the hall. So much hype. So much Instagramming. Why? Well, they created a product that was extremely novel and photogenic, and thus, social media went crazy. 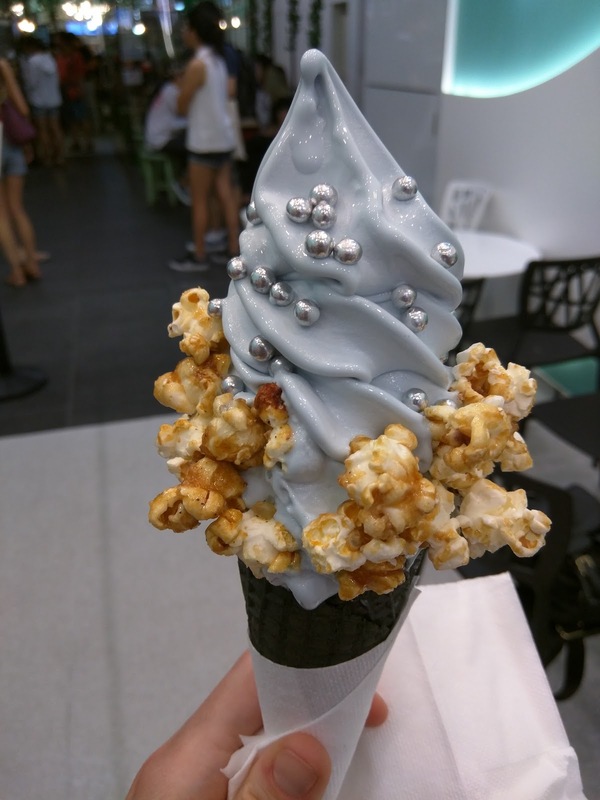 Baby blue soft serve, in black cones, surrounded by a cloud of cotton candy, garnished with caramel corn. Yes, seriously. I walked by a few times (including when I got matcha ice cream across the hall at Chanoma), and I was tempted to swing through myself, but, figured it was all hype. Something that over the top can't be good, right? On my recent visit in February, the hype had worn down, but, reviews were still very positive. People comment constantly on how creamy the ice cream is. I grew up in the land of soft serve ice cream, so, I'm always on the lookout for good soft serve (NOT froyo, ice cream!). 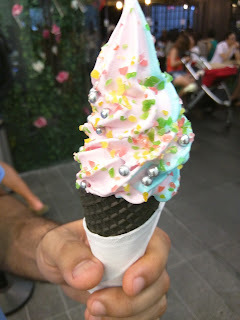 So, ridiculous toppings and colors aside, it went on my list of possible places to try. A few days into my trip I looked up Aqua S's weekly special flavors, and it was a done deal: taro and rose. I adore taro. I had to visit, no question. I dragged Ojan with me. Somehow, even on a 95 degree Sunday, at 2:30pm, there was hardly any line. The ice cream was great, and I'll certainly be returning. The small shop is decorated in ... aqua. Aqua, aqua, everywhere. There are a few tiny tables, but even on a non-busy day, they were all full (except the one pictured here, which was filled moments later). Most patrons take their ice cream and wander through Regent Place, where it is located, and show off their ice cream for basically everyone else walking by to gawk at. And gawk they do. For good reason. 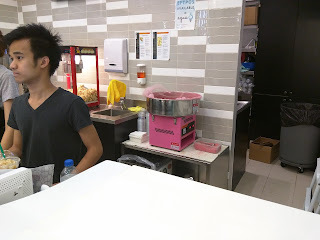 Popcorn Machine, Fairy Floss Machine (cotton candy). The menu at Aqua S is not extensive. Only 3 flavors of ice cream, one of which is always the signature Sea Salt, and two other flavors change every two weeks. You can swirl either of the weekly flavors with sea salt, but not each other. Cup or cone. One size. And then, 4 toppings to pick from ($1.50 extra). Topping choices are ... interesting. No sprinkles, no chocolate dip. Instead, they have fairy floss (cotton candy), sweet popcorn, popping candy, and ... grilled marshmallow. Yeah. If you opt for the fairy floss, it forms a halo around the cone. It looks ridiculous, and I don't think makes any sense. How would you possibly eat that? Anyway, right behind the counter is a fairy floss machine, making it to order, and a popcorn machine filled with the sweet popcorn. 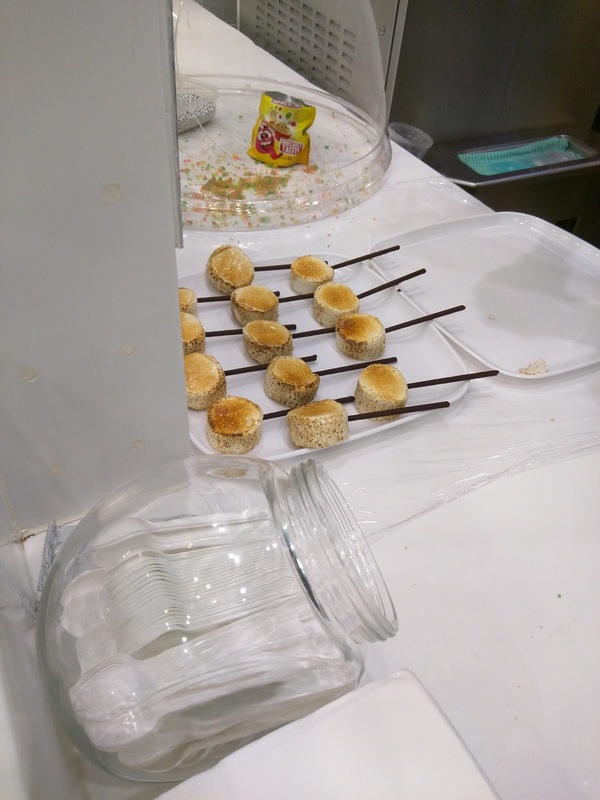 Grilled Marshmallow and Popping Candy Station. At the counter in front is the popping candy and grilled marshmallow station. The marshmallows are on sticks, and then just stuck into your ice cream, which also doesn't really make sense to me. Taro, with Sweet Popcorn, and (Free!) Valentine's Day Pearl Balls. $5.50. I obviously went for the taro. I added the sweet popcorn because I love caramel corn, and, the bonus free topping of silver balls, which are not normally available. This was a special for Valentine's Day. I kinda laughed when I got my cone though. It looked good, but ... uh, how do you eat popcorn off a cone? I picked off a kernel, and then realized the bigger problem. My cone was melting fast, and I had no ability to lick around it to save it. Within moments I was going to have ice cream dripping down my arm. Uh-oh. So, I set about eating the caramel corn first, picking it off as fast as possible. But ... it wasn't actually good. It tasted stale. I didn't actually want it. So, I just picked it off and ditched it. Then I could lick around my cone, save it from melting, and enjoy it. Phew. A stressful moment was had though, I assure you. Ok, so, sweet caramel corn? Not recommended as an ice cream topping. The pearl balls were fine. As for the ice cream, I didn't actually taste a ton of taro. But it was the creamiest, smoothest, soft serve I've probably ever had. It was really just absolute perfect consistency. Not icy, not over churned. Just, perfect. And it melted beautifully, albeit rapidly, in the 95 degree heat. 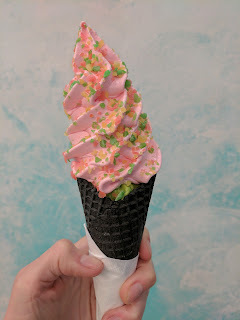 The cone was black, but tasted the same as any other sugar cone. I was hoping it was chocolate. So, overall, well, it was damn good soft serve. I'd get it again, but obviously leave off the popcorn. $5.50 for a cone though ... a bit steep (but it was only $4 without the topping). Rose and Sea Salt Swirl, with Popping Candy, and (Free!) Valentine's Day Pearl Balls. $5.50. Ojan opted for the signature sea salt and rose, swirled, with popping candy. His was beautiful, the aqua blue sea salt and the pretty pink rose were both stunning, it was covered in colorful candy, and had some bling from the pearls. The sea salt really didn't taste like much to me, it was sweet, but honestly, I didn't taste any salt. The rose however was really quite good, which shocked me, as rose is not really a flavor I normally go for. But it was sweet, subtle, and really, really quite good. 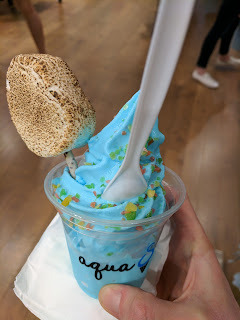 While many of the toppings at Aqua S are totally impractical, it turns out, popping candy really is quite fun, and just as easy to deal with on a cone as sprinkles. However, $1.50 for a little sprinkle of popping candy seemed ... excessive. 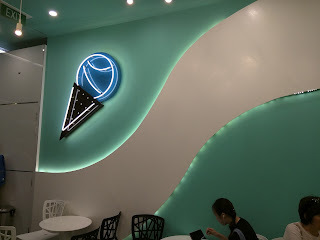 His was also a perfect consistency, really quite good ice cream, and I'd gladly get the rose again, although I wish I could swirl it with taro. Samosorn Thai is a "thai local food hall", located on the side of the food court in one of the Westfield malls in Sydney. 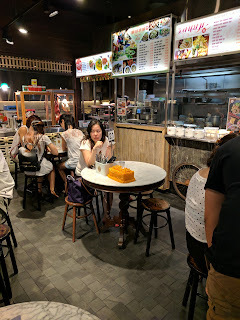 It is a spinoff of the ever popular Chat Thai chain, which I've visited many times over the years for their fascinating desserts. Just like with most of my visits to Chat Thai, I went to Samosorn just to pick up a dessert to go, but I did take in the atmosphere. Samosorn is adjacent to the food court, but, off to a side, so it is able to have its own decor and distinctive area. Samosorn is more casual than the Chat Thai locations, as there is no formal table service. 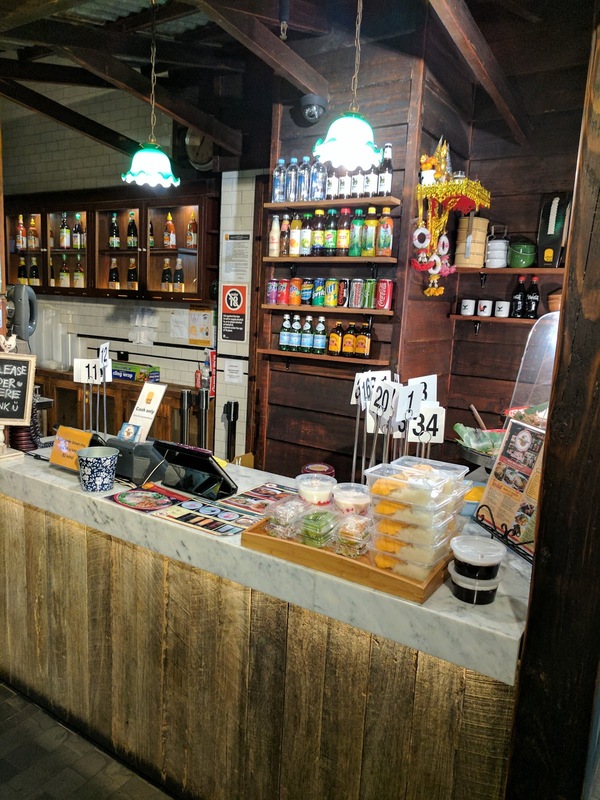 All orders are taken at a register, and you are given a number and can go sit at any open table. Food is brought to the tables as it is ready. The registers also have a few packaged desserts to grab. The full menu is on display above the little stations, as it is supposed to look like street food stalls, even though you order at the register, not at the stalls. There is not a lot of space, and tables were snatched up as soon as they were free. I was lucky I was planning to take my food to go anyway. 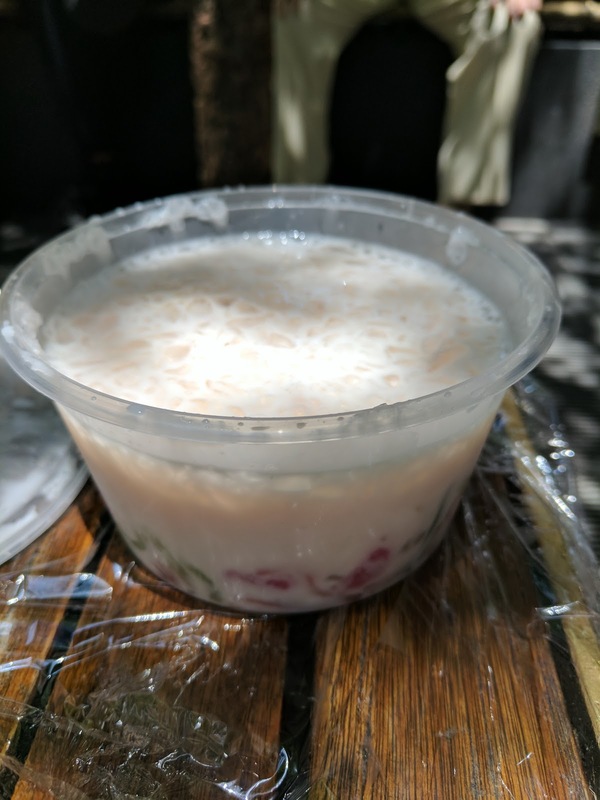 My visit was on a very hot afternoon, and I had my eyes set on one thing only: a refreshing dessert. I placed my order to go, and stepped off to the side to wait. Many of the desserts on the menu were the same as ones I had tried at Chat Thai, so I selected the only one I hadn't yet tried that also had ice as an ingredient, since I wanted something refreshing. 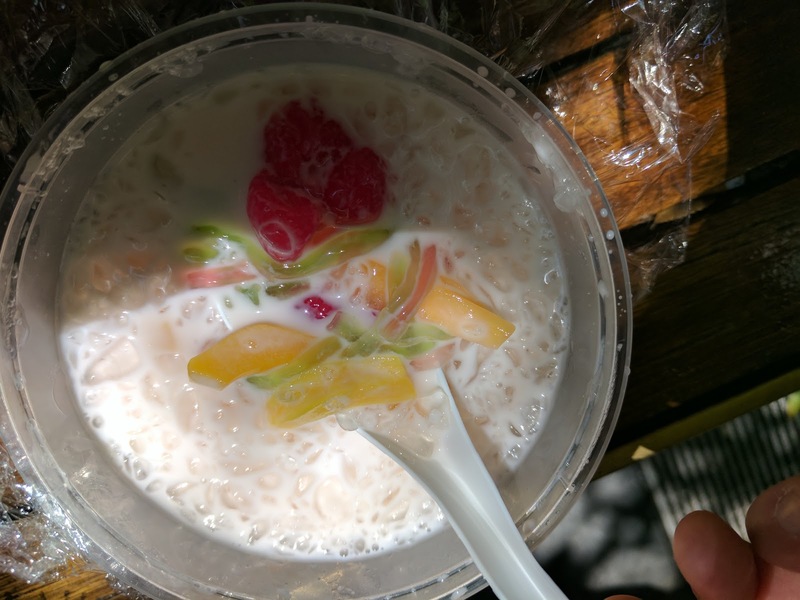 "An assortment of jellies, candied seeds and pandan noodles in an aromatic coconut syrup with shaved ice." In some ways, the ruam mit was similar to the Lodt Chong Nahm Kati I had from Chat Thai, with a coconut milk base, shaved ice, and pandan noodles. The pandan noodles were soft and kinda fun to slurp up. The milk base was very sweet, but not too sweet. The ice made it refreshing. What did I have inside, along with those light green pandan noodles? Pink noodles, that were exactly the same size and texture as the pandan noodles. I'm not sure what flavor they were supposed to be. And then, slices of an orange fruit, I believe jackfruit? This was similiar to the orange fruit I had in the khao dtom nahm woon, also from Chat Thai, before. I really liked these. And last, the pink balls, which I'm pretty sure were tapioca coated water chestnuts, just like I had in the Tup Tim Grob, except these were actually good. They were crisp and crunchy, with a slightly soft exterior. Delfina. Definitely a San Francisco institution. When I first moved to San Francisco, I remember a friend telling me that the Delfina Restaurant was his favorite place for a nice, but casual, night out with his wife. I remember going once or twice myself, and liking the pasta, but not having a particularly strong opinion otherwise. My hipster group of peers of course frequented Pizzeria Delfina in the Mission, long waits on the cold sidewalk no hinderance. I joined in from time to time, and enjoyed the pizza, but never quite understand the hype. I was personally happy when a second Pizzeria opened in Pacific Heights, with substantially shorter lines, and, uh, more appealing sidewalk ambiance. Since then, the restaurant group has seen great success and expansion, with more pizzeria locations in Palo Alto and Burlingame, and Locanda, a second restaurant in San Francisco, focused on pasta (which I have another friend who says is his favorite place in the city). My strongest memory of Delfina however isn't of any of the restaurants, it is of attending a cooking demo at Macy's by the chef/owner, Craig Stoll, where he talked about the restaurant, told amazing stories, and cooked 3 of the most famous dishes. I was so impressed, I wrote it up on my blog, and vowed to go to Delfina for dinner immediately (which, uh, I never did). But the memory of those dishes, a seemingly simple salad, basic spaghetti, and panna cotta (seriously, probably still the best panna cotta I've ever had ... and I've had a lot) remained strong. One afternoon, the admin for our team sent me a message, saying she'd mistakenly ordered too much food from Pizzeria Delfina. I'm not entirely sure how this happens, but, I was happy to receive the message, and pass it on to my colleagues. And then I got pulled into a conversation, and wasn't able to go running for the food. By the time I got to the food, a mere 15 minutes later, the large pile of pizza had been decimated. There were tons of pizza boxes, all completely empty, on the table. Doh. Pizza in general doesn't last long around my office, but, pizza from somewhere like Pizzeria Delfina really doesn't last long. I learned my lesson: get things for me first, then tell others! 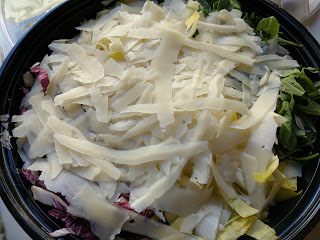 "Arugula, radicchio & endive salad w/ grana padano cheese & lemon vinaigrette." Insalata Triocolore. Such a classic Delfina (and many Italian restaurants) salad. So deceptively simple, but oh so good. The salad of three colors. Yes, it is just a mix of three colors of leaf vegetables (green arugula, purple radicchio, and pale yellow endive), topped with grana padano, and served with lemon vinaigrette. No other veggies. Nothing for crunch. Boring sounding dressing. This salad shouldn't be great. But it really is. The arugula is my favorite element, so peppery. I'm not sure where Delfina sources arugula from, but this is quality stuff. Then there is the endive, chopped into slices, juicy and refreshing. The radicchio, julienned, which provides a different sort of bitterness than the arugula. Mix them together, and you have a blend that not only looks great, but also has perfectly complimentary tastes. For a base of leafy vegetables, this is far more interesting than most. The cheese I actually didn't love, as the shreds were huge, and the nutty flavor from the grana padano somewhat dominated the eating experience. And then the dressing. Simple lemon vinaigrette. I'm definitely a creamy dressing type, and rarely like vinaigrettes. This dressing looked like nothing more than olive oil, honestly. And, it isn't much more than olive oil actually (olive oil, champagne vinegar, lemon, shallot, and black pepper), but wow, it was good. And somehow, that dressing just went so amazingly well with the leafy vegetable mix. I'm clearly not the only one who loves this basic dressing, as Delfina even sells it by the bottle now. What this salad proves is that sometimes you don't need more than a few simple high quality ingredients, well chosen for their complimentary nature. I believe this was the large, family-style portion, designed to serve 10 people, for $85. At the demo, I had an enhanced version, the Insalata di Campo, with the same base mix of greens and cheese shreds, but it also included pancetta and walnuts, which added crunch and an additional salty component. I preferred that version, but, this basic salad was also fabulous. "Pork, beef & veal meatballs w/ tomato sauce & crostini." I have a memory of getting the meatballs once a long, long time ago. I think I liked them. But this was, literally, 10 years ago. So I was happy to see the meatballs go unclaimed, as I'd get to try them again. 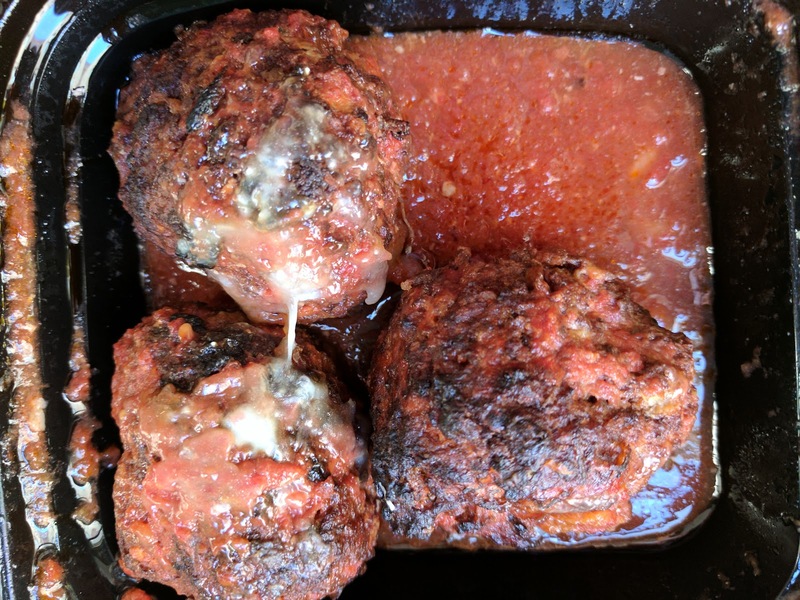 The meatballs are huge, and all had a nice crust on them, if you know what I mean. I like a meatball with a bit of a sear on it like this. Inside was quite moist, and the mix of proteins (pork, beef, and veal) created a fairly complex flavor. The sauce was not my favorite. It was rather sweet, in a way that I didn't want it to be, if that makes sense. Overall, I didn't actually care for these, but they were well made. I also was able to try the burrata appetizer, but failed to take a photo. It was served over a bed of arugula, with crostini on that side, and a separate container of extra virgin olive oil to drizzle on top. I appreciated everything about the dish. I love having creamy burrata with bitter arugula, and always like to drizzle olive oil over my burrata. This was exactly what I want in a simple burrata dish, although I didn't want the crostini, which I was happy to leave for the others, who don't find it appropriate to just eat cheese drizzled with oil by the spoonful. As much as I acknowledged the goodness of this dish, I didn't love it. The burrata itself just wasn't as ripe and creamy as it can be.